According to The New York Times, more than 41 million Americans are food insecure and over 40.6 million people live below the poverty line. With these numbers being almost identical, there is no doubt that there is a deep connection between poverty and food insecurity. That is why, when the Hall Hunger Initiative (HHI) discovered that 80% of Hispanic children in Dayton, Ohio are below the poverty line, they realized it was time to act. The Hall Hunger Initiative (HHI) team quickly realized that this was a population that anti-hunger efforts had inadequately tapped into, so our work was going to be groundbreaking! In order to learn more, it was imperative that we listen to the community that we want to serve; therefore, the team brainstormed culturally appropriate ways to engage and introduce the organization to the community. As the manager of the project, I believed a posada with Latinx community leaders and the HHI team would be a fantastic idea! A Posada is a Christmas tradition in Latin America. As a part of a Christmas celebration, traditional parties known as posadas are held for family, friends, and neighbors. Posadas are not just traditional rituals but also an opportunity for cheerful socializing, authentic food, a traditional Mexican Christmas drink called ponche, and fun. Overall, this would be the perfect introduction event! Moreover, traditions such as a posada represent a critical piece of the Latinx culture, and HHI hosting such event would contribute to a sense of comfort and belonging. I believed that it was important for HHI founder Ambassador Tony Hall and his team to get to know the community through a cultural lens. By listening to learn, or otherwise known as deep listening, we build cultural competence which provides us the ability to better serve our Latinx community. On December 13, 2018 my home was full of leaders in the Latinx community such as business owners and active community members. Additional attendees included Ambassador Tony Hall, the HHI team, Montgomery County commission assistant Mark Willis, and Sinclair College professor and GEM City Market founder Amaha Sellassie. 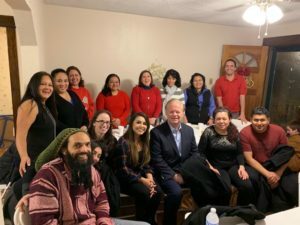 For almost two hours, we laughed, sang, ate traditional Mexican Christmas food and drinks, and talked about food security in Dayton’s Latinx community. What we heard shocked us all. The HHI team discovered that individuals are eligible for SNAP but are either discouraged or turned away due to both language issues and a general lack of culturally competencies. Furthermore, not a single food pantry in the Dayton region distributes culturally appropriate food. As a result, the entire HHI team became better prepared to help after the extensive deep listening session. The posada was an introduction that kick-started one-on-ones with community members, outreach to culturally appropriate food pantries, the development of leaders addressing the unique issues faced by the Latinx community, and conversations revolving SNAP and Latinx outreach. After identifying barriers and brainstorming opportunities to connect resources, we are developing a strategy to build partnerships with local Latinx community members and food pantries in the Dayton region in order to establish the first-ever culturally appropriate food pantry serving the Latinx community of Dayton, Ohio.